It is an exciting event for parents to get a new child. To express that excitement, they will get ready for the nursery and other things for their new family member. A nursery would always have a theme which also depends on the gender of the baby. 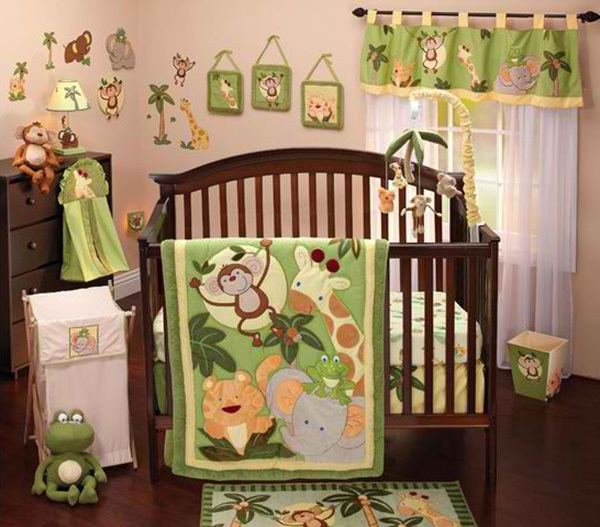 One theme that fits both males and females is a jungle nursery. Aside from the decorations, the crib beddings would complete the look of a nursery and it is what will make your little bundle of joy feel comfortable while sleeping and playing. 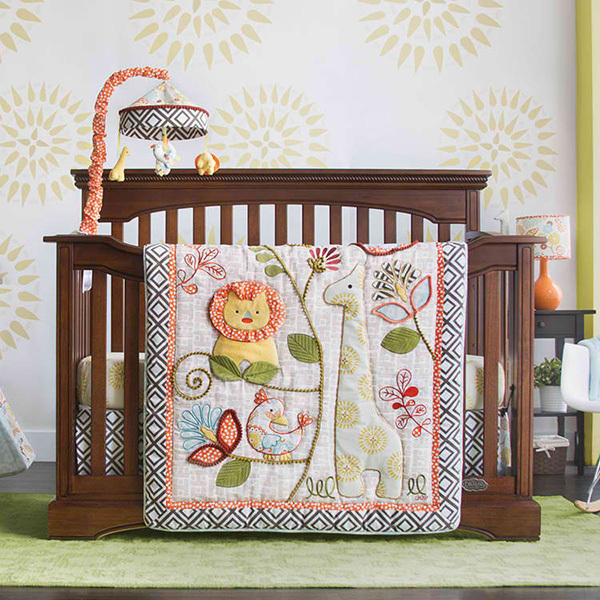 A jungle themed nursery is one of the favorite themes for parents because it features cute animals and lovely colors. Also, it is not really hard to create a jungle themed nursery since there are available decors from wall decals to crib beddings. So today, we will give you a list of some jungle-themed bedding for your little one’s bedroom. We are sure that parents-to-be or even parents-wanna-be will adore these crib beddings! 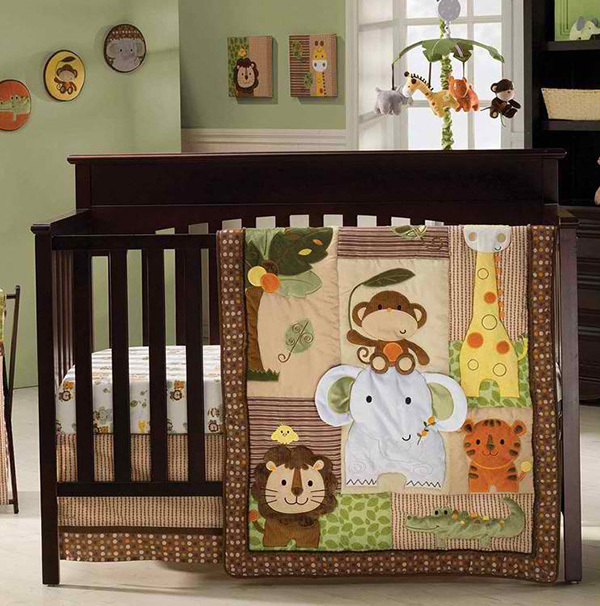 An adorable crib bedding that features cute designs of monkeys, giraffes, elephants and lions in stylish colors. Your little love will sure settle down with joy on this comfy set! Get a crib bedding in bright greens, yellows, and more. This set includes a comforter, bumper, sheet, dust ruffle, diaper stacker, and valance for a mighty sweet jungle nursery. This bedding set contains a fitted sheet, diaper stacker, dust ruffle and quilt with super cute jungle animal designs. A jungle themed crib bedding can also be perfect for a baby girl with its detailed monkey, lion, giraffe and elephant appliques and embroidery works. 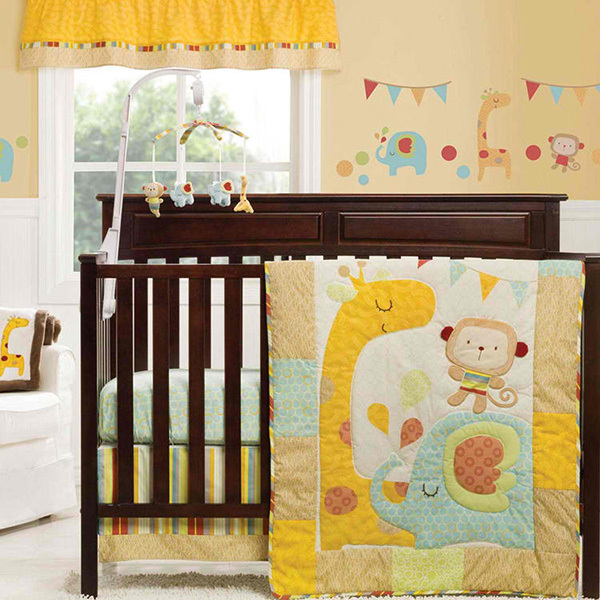 Yellow and grey cute jungle animals with accents of green on a blue striped background could surely give the nursery a cool childish look. 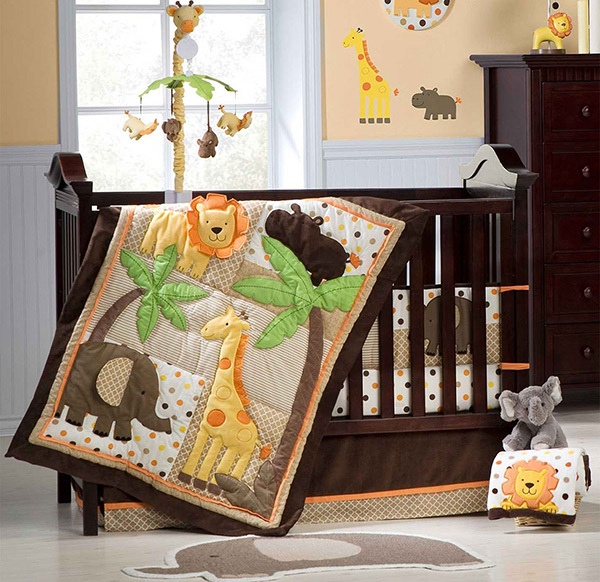 Charmingly sweet jungle themed crib bedding that doesn’t just have animal appliques but also combinations of different patterns to make it look even more attractive. Bring in delight with this crib bedding in golden yellow and light tan with accents of soft green and aqua. You’d love the cuteness of our animal friends here! A set that features an enchanting theme featuring a tropical foliage, lion, giraffe and bird in an artistic quilt and embroidered appliques. This set might not be set in the jungle but it does show jungle animals in Noah’s ark. This could be a good way to start your Bible stories with you little one! 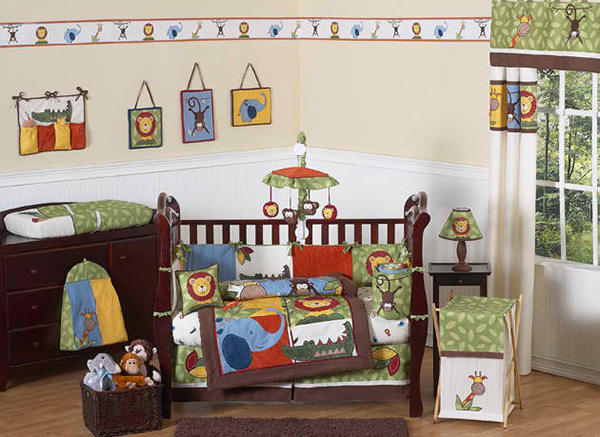 Many jungle animals from flying owls to crawling squirrels are featured in this crib bedding set in different colors. Playful colors of green, brown, orange, purple and pink that also feature a zebra, giraffe, elephant, monkey, hippo and bird in a fun setting. Lovely colorful crib bedding set with chevron and geometric patterns. Combining it with numbers and letters is indeed awesome! 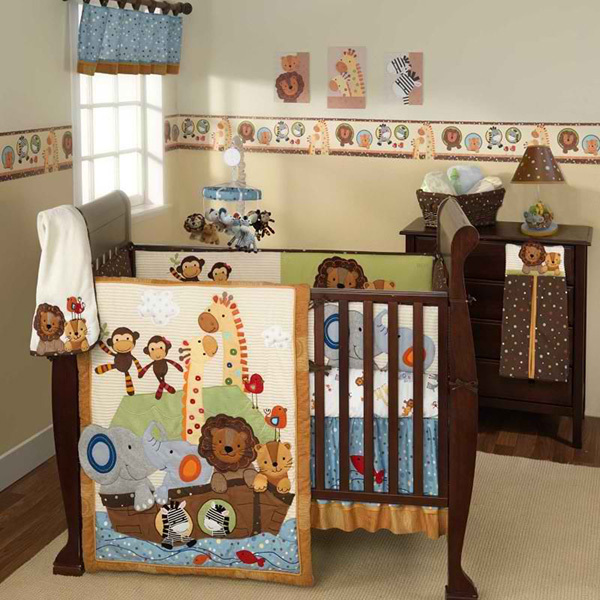 If you get this set, you will surely have a nursery to brag about as it is decorated in pretty jungle animals. 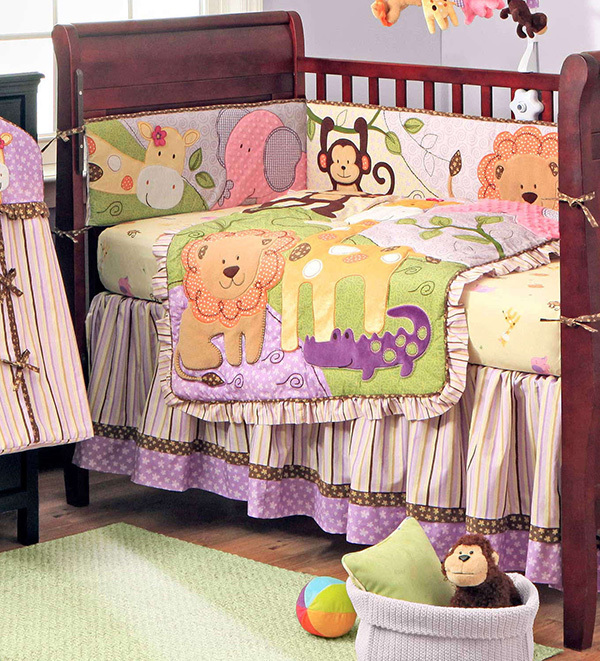 Bring in the jungle to your tot’s bedroom with this bedding in friendly and fun animal designs. It’s a jungle out there in the big wide world, but for your tot, you can make their jungle cute, friendly and fun. The gang is all there — lion, croc, monkey, elephant and more. These cotton crib bedding sets make your little one’s zoo a happy place to nap and sleep. If you really want to pull off that jungle feel, then this one would be perfect because of the greens in it! They sure are cute, right? Well, any parent will fall in love with these crib beddings just the way they love their little ones. 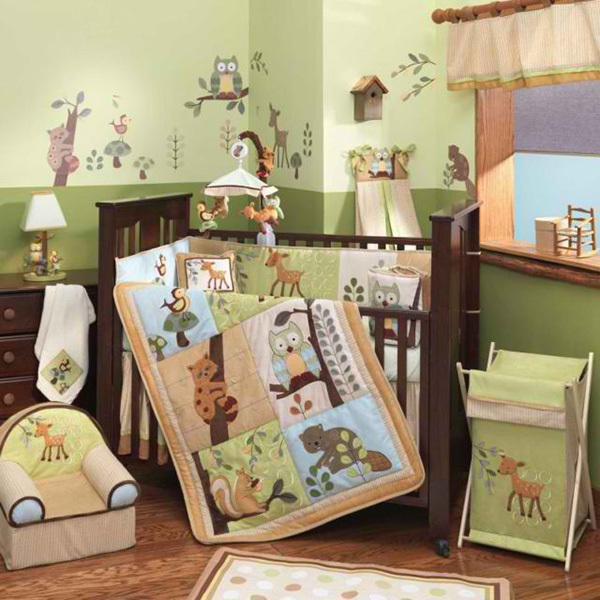 And for sure, the babies will react and respond to the colors and cute animal designs that they see in the nursery. It would be a good way to prepare your baby to see the more colorful outside world! For bigger kids, you could get bunk beds with slides for kids to add more fun in their bedroom. A spirited team with the mission to offer interesting inspirations and ideas on everything about bedrooms. We aim to fuel both curious and creative minds through helpful and engaging features. © Copyright 2017, Bedroomm.com. All Rights Reserved.